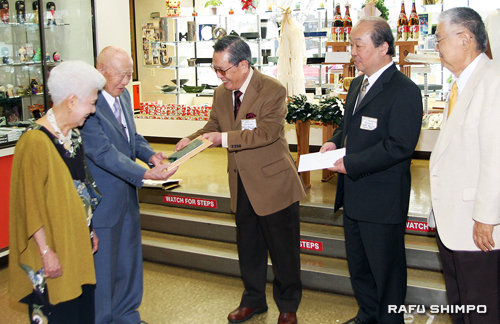 Rafu Bussan, the Japanese import and china store, celebrated 55 years of serving the Japanese American community on March 4. 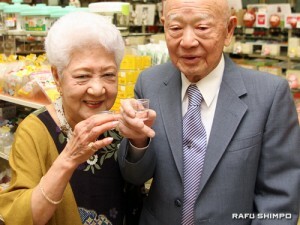 Kiyoshi “Skip” and Aiko Kawaratani share a toast as their store, Rafu Bussan, celebrated its 55-year anniversary on March 4. Rev. Al Tsuyuki of Konko Church of Los Angeles performed a Shinto purification rite at an altar set in the Little Tokyo showroom among the displays of vases and china. Kiyoshi “Skip” and Aiko Kawaratani, who also celebrate their 60th wedding anniversary this year, marked the occasion by donating $10,000 to Keiro Senior HealthCare to honor all the customers who have supported Rafu Bussan for the past 55 years, many of whom are Keiro residents. A luncheon was held in the Garden Room at the Japanese American Cultural and Community Center, catered by Aki Hirose of Maison Akira. Brian Kito of Fugetsudo donated manju for the occasion. The Kawaratanis take great pride in the store, which first started at 344 E. First St. in Little Tokyo. 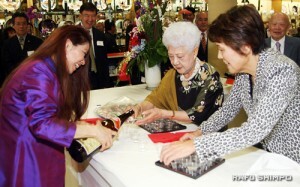 Guests at the ceremony were given tea cups inscribed with the Japanese phrase “Kono michi hitosuji (on this path, there is only one path).” Aiko explained that the phrase describes their singular dedication to the business that sells kitchenware, lacquer ware, porcelain and Japanese dolls. Rafu Bussan was founded by Yukio Tanaka and Junichi Oishi, who started as traveling merchandisers, taking orders from farming families returning from internment camps for staples such as rice, tea, Japanese canned goods and rice bowls. Sake is poured for attendees. Skip traveled to Japan to work with an American trading company in Tokyo and he returned in 1956 with his new bride, Aiko. He purchased Onishi’s share of Rafu Bussan, and partnered with Tanaka for eight years. 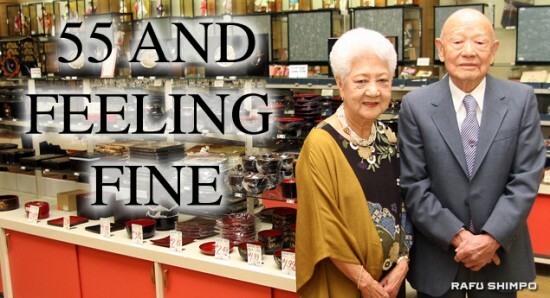 In 1966, Skip and Aiko became sole owners of the business, expanding to its current location on Second Street to showcase Japanese imported dinnerware, folk art, lacquer and other gift items. As the face of Little Tokyo is changing, it is their hope that the store will continue to flourish and meet the needs of the growing surrounding area, and also to educate the public and perpetuate true Japanese culture. The Kawaratanis made a donation to Keiro Senior HealthCare during the celebration. They are joined by (from right) emcee Howard Nishimura, and Takeshi Oishi and Yoshihiko Koyasu of Keiro. Rev. 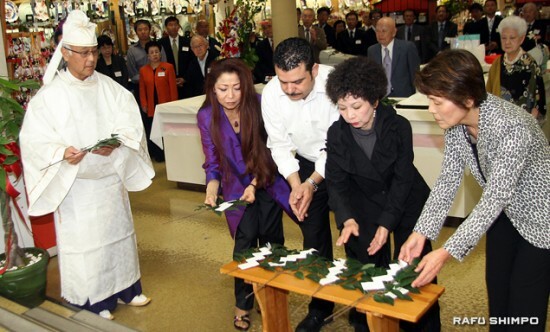 Al Tsuyuki observes as Rafu Bussan employees (from left) Carol Tanita, Rigoberto Martinez, Kayoko Hamano and Sachiyo Teraishi make offerings.